There's no feeling quite so relaxing as sliding back into a strong reclining chair and letting the seat's deep, inviting cushions take all of the weight off of your shoulders. 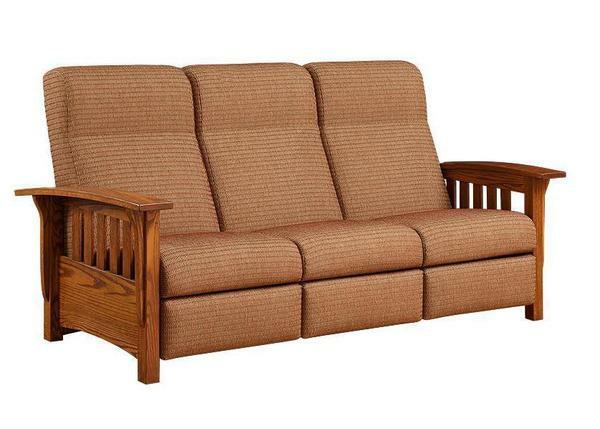 The American Mission Reclining Sofa, handcrafted to order in a small Amish woodshop in the northern United States, is an upholstered sofa that wants nothing more than to provide you and yours with this incredible kind of experience every day. With three individually reclining seats each set on ultra-supportive bases and filled with industry-leading cushioning, the American Mission promises long years of everyday luxury. To get started, simply select your ideal materials from the menus above. If you have any questions at all - or if you would like to talk with us about having the woodshop craft a custom sofa for your unique needs - please don't hesitate to get in touch with us by phone or by email at any time. We love how this reclining sofa brings individual comfort to the family night in, and we would love to talk with you about it.